The Wonderland Series is a project that highlights the importance of photography production when creating exquisite images. The Wonderland Series was undertaken by photographer and artist Kirsty Mitchell. The project was a very personal undertaking, in that it was dedicated to the memory of her beloved mother Maureen. Kirsty’s mother Maureen was an English teacher, with a love of the written word. Maureen’s great passion in life was literature, storytelling, and books. She passed this love onto her daughter. Her most vivid memories of her mother were of the stories Maureen read to Kirsty throughout her childhood. The Wonderland Project was Kirsty’s way of paying tribute to the things that meant so much to her mother. It was also a way of documenting her journey through grief and saying goodbye to someone who meant so much to her. The Wonderlands Series is one of the most involved photographic projects that has ever been undertaken and shows how crucial photography production is to a final image. This deeply moving project took the artist over 5 years to create. It then took an additional two years of Kirsty working to independently get the book published. The completed volume contains over 640 photographs and features all 74 pieces in the Wonderland collection. It has extensive behind the scenes imagery that documents the degree of photography production involved in this project. There are also costume galleries of the intricate pieces that were designed, created and completed by Kirsty. The series beautifully documents two different worlds. The fantasy of the finished photographs, but also the deeply emotional journey that Kirsty went through to bring it to fruition. She has an online diary that is full of her reflections on grief and that narrative runs through her work and is an essential part of the finished product. As the project was so deeply personal for Kristy she wanted to complete the series on her own terms. Because of this, she decided to self-publish the Wonderland book so that it could be represented fully as she had imagined it. 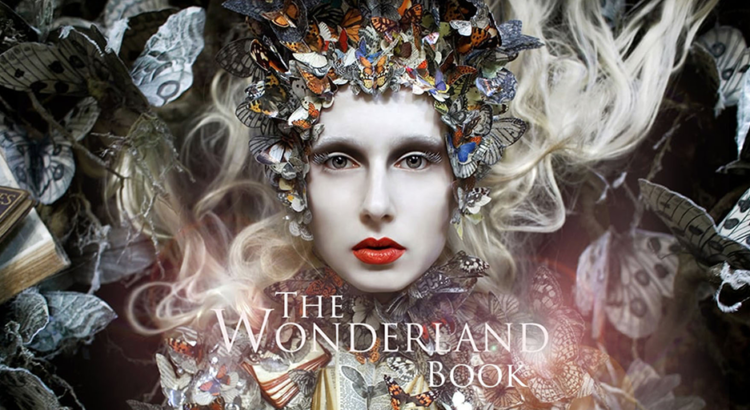 In October 2015, the Kickstarter campaign for the Wonderland Book became the most funded photobook project in the history of the crowdfunding website. The book was sold out within 2 months of it being published in December 2015. It was overwhelmingly received and due to public demand, a revised 2nd edition of the book was published in November 2016. The extent and magnitude of photography production involved in the Wonderland Project is difficult to grasp. It is probably one of the most involved examples of how much of an important role photography production plays in the role of photography. Production alone took 5 years to complete. Harper’s Bazaar said of the Wonderland Project, “Kirsty Mitchell’s work is unlike anything you have ever seen before.” After the loss of her mother ,Kirsty had a desire to block out reality. She also wanted to do something that would celebrate who her mother was a person. Creating the Wonderland Project as a book intended in Maureen’s memory was how the project began. Kirsty’s two great passions are art and photography. She used both these skills to create the Wonderland Project. It is interesting to note that Kirsty prefers to call herself an ‘artist with a camera’ rather than a photographer. The reason for this is due to the enormous amount of work and photography production that she needs to go through before she presses the shutter. Pressing the shutter takes a moment, but the finished image that we see also can involve months of work before and after this brief moment. All professional photography involves a degree of photography production. Obviously, not all forms of photography would involve the extent of work undertaken by Kirsty Mitchell but it is an interesting project to study to have a great appreciation of what is involved in producing one high quality image. Kirsty designed and hand made all the costumes, props and sets for each spectacular image. In some instances, it took up to 5 months to create every element that was required for the completed photograph. The images were inspired by the tales that Kirsty’s mother used to read to her. The titles, the stories, the images, the memories. Kirsty deliberately wanted to create images that people could lose themselves in and project their own ideas and emotions onto. Each image was a visual fable. The Wonderland Project is best described by Kirsty herself. She says of it that it was a cross between fantasy and her personal journey of grief in the real world. Kirsty Mitchell is known as a perfectionist and for that reason ,the photographs that she produces are the absolute best that she can create. She pushes herself before and after that simple press of the camera shutter to her maximum. As a result, despite the amount of time that each image required, it ensured she was extremely proud of them. Photography production is not just a part of the preparation before the shutter is pressed. It is also a vital part of what happens afterward and the journey that then occurs to create the final image. Kirsty wanted to self-publish to have control over how the photographs were produced. She needed the book to reflect the exact same color levels, quality, and details that she put into the actual creation of her images. Kirsty then worked extensively with book designer Stewart Smith. Stewart has produced over 700 photo books over the course of 30 years. Through his work with publishers and galleries and with his long experience, he could understand what Kirsty required. For Kirsty, she wanted the book to bring together the fantasy and reality of her journey. It was important for her that all areas were covered. Not only the finished photographs but also the painstaking process of their creation. Kirsty wanted her viewers to feel that they were with her as she pressed the shutter. She also wanted them to understand what it took to get there, and what was involved afterward. Photo production is all about the art and science that goes into creating beautiful photographs. It is about the process of creating a photo from start to finish. From an initial idea through to shooting and editing of a photo. The Wonderland Project is a wonderful example of how involved photography production can be. The finished result is a series of photographs that are hauntingly beautiful and stay with the viewer for a lifetime. The photography production involved in resort photography is extensive on the set, however, the pre production that Kristy undertook for each one of these images is like nothing I have ever seen. I highly recommend getting your hands on one of these books. Where can you buy Kristy’s photography Book? Due to recent request’s I have decided to do a bit of research. I found Kristy’s book on Amazon please find the following link to her book. I do have to warn you that it is not cheap but I would say it is totally worth it. Wow the quality of the photo is crispy as hell. What kind of camera did you use? Hi amaterasu123 this is actually not my work. It belongs to a photographer named Kristy Mitchell. She is a fashion photographer from the UK. I am more of a Hotel photographer and I like to focus on architecture. Her work is so fascinating. Is there a link where one can buy her collections? I am not sure Rain. I’ll look into it. I have added a link to her book which I found on Amazon. I’ve always appreciated the effort that artists put into their work. There are plenty of people who take photographs nowadays especially with the available technology but it takes something special to make your work pop out among the rest. And to me Kristy Mitchell’s work definitely pop out. The photos were really AWESOME!!! but, this isn’t just about how excellent the photo was, but how deep is a mother’s love to her child, and how much a child loves her mother even when they are already apart. It’s somehow heartbreaking, but looking at the picture, the concept, the emotions, the details, the story behind it, and everything about the work all you can utter is “it’s just amazing”. The love shown was so deep and I and all the readers, watchers of this article may now be drowning. I really love it! Thanks to this article I like photography more than ever. It’s perfect as ABC. I think the project highlighted in the article is elaborate as it took 5 years to be completed. I like Photography this is so good I wonder how to capture this one super clear. I love art and photography too and this far by one of the best I have ever seen. Kristen Michell’s books and the photographs are an inspiration and she has proved that imagination has no limits by combining the fantasy and her personal journey. I salute her hard work, determination, patience, and her passion for creating this marvelous wonder. I would search if I could buy this book somehow. She is truly inspiring. I wish her good luck that she creates more master piece like this in the future. Absolutely breathtaking. This just goes to show the work that artists and photographers have to go through in order to capture or create the wonderful pieces of art that we, the consumers, get the privilege of witnessing. I hope one day I too can capture something as gorgeous and marvellous as this. Wow, Kristy Michell’s works are awesome. Really detailed! Do you consider doing fashion photography too? Or do you want to focus on architecture? What a great way to remember your loved ones by. I have to say this project is absolutely spectacular and surreal. Great work by the photographer and by you, I wish you the best of luck! I commend this young lady for doing this. The greatness that rose from her loss in nothing short of monumental. This is an epic production that I will follow and support 100%. You just don’t read stories like this every day. You blog truly highlights the best of the best. This goes to show that pointing your camera is not enough. It takes very special skill to pull off lifelike shots. Does camera model/ type affect photo quality? What kind of camera did you use. Photography is an underrated universe. There is a lot that is going on in it than people think . Photo production? This is the first time I heard of this. Is that another branch of photography?